These wrist warmers are reversible with a different pattern on each side. The main side has a series of cables, while the reverse side has a classic ridged pattern. The finished wrist warmers are nice and thick for the winter weather while still providing mobility for your fingers. This pattern is great for practicing or learning cable stitches! Plus, no sewing is required. 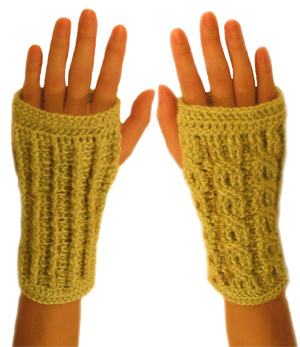 Need help while crocheting your wrist warmers? Just let me know and I’ll help! This entry was posted on Sunday, October 3rd, 2010 at 12:00 PM by Rachel Choi	and is filed under Best Crochet Patterns. You can follow any responses to this entry through the RSS 2.0 feed. You can leave a response, or trackback from your own site. These are so neat! I’ve been wanting to learn to do cables, this will be the project to try it on. Plus, I know you’ll help me out if I get stuck. You’re always such a dear. These are totally awesome! I can’t wait to try them! Thanks for all your tips and help it is awesome that there are still people nice enough today to want to help others………….it does get passed on. Keep up the great work! How do I know if I am ready for an Intermediate project like this one? Hi Nikki, I think that’s a question only you can answer. But I can tell you that this pattern uses mostly front and back post stitches. If you already know the concept of front and back posts, it’s a plus. If not, then you can always learn how to do them in the tutorial I linked to. Plus, if you need help with the pattern, just email me with any questions and I’ll help you out!